Bend the paws of Aimee Furnival's playful animals around your plants for some wild style. From slow-living sloths to swinging orangutans, some animals are right at home just hanging out. Short of starting your own nature sanctuary, bring some wild style to your houseplants with these playful metal decorations. Aimee Furnival's mini menageries come are cut from stainless steel plated brass. Choose either the jungle creatures—sloth, orangutan, and chameleon—or Australian bush critters—koala, tree frog, and bush baby. Install them in a snap just by bending their hands (er, paws? claws?) around your favorite plants' branches. Don't have a green thumb? These critters make great accents for your cords and cables, too. 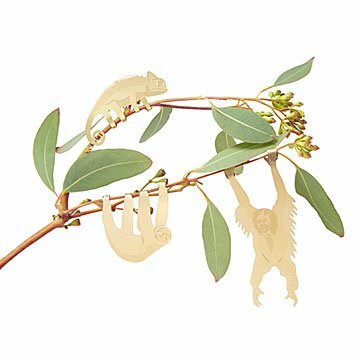 Hanging around an office or sunny window, they make sweet gifts for any animal lover. Designed in London. Made in China. Inspired by the structure and elegant abstractions of origami, London designer Aimee Furnival loves to work with sheet material, be it paper, metal, or wood. She gets really excited by the challenges of transforming something flat into a 3D form, believing that when creativity meets free play with materials, brilliant designs are born. She also enjoys combining traditional materials and handmade processes with modern, mechanical production methods. Her cheerful studio is located in central London where she's constantly inspired by the incredible architecture and pockets of green parks dotted around the city. This interest in the urban landscape, combined with the love of all things miniature, has inspired a series of city-themed souvenirs as well as nature-inspired gifts. My mom loves small, unique accent decor. These look so cute on her indoor plants and are easily moved to flowers when she has them on display. I definitely plan on buying more of this item. My mom has them hanging from branches of her indoor plants and they look adorable. I plan on buying more of these! My sister has them hanging from branches of some of her indoor plants. Just the thing for one who likes iguanas, sloths, & chimps! A gift for someone else, but think she will place them on a plant. Cute! These animals are adorable! They are a bit smaller than I realized but so cute! The design is as adorable as pictured and adds a little whimsy to your plants. However they are even more delicate than expected and in initially placing them on my plants I did the Chameleon first and I attempted to readjust (once) the feet so it would set/grip better and the feet broke off; I was able to bend the next/higher part of his leg and attach him but this happenning so quickly was still a bit disappointing. I was then extra cautious and tried to not readjust the others in anyway (which the orangatan and sloth are slightly larger were you bend them too) and they were fine. Great, unique gift! My friend loves gardening and it's a perfect birthday gift. I only wish this came in better packaging since it's such a great gift item. I finally decided to get these and I am so happy I did! They are hanging in my plant at work and they are adorable. I love the orangutan!